Pairing refers to the process of pairing Bluetooth® cell phones or devices with the system prior to connection. This is a necessary procedure for Bluetooth® connection and usage. Up to five devices can be paired. 1. 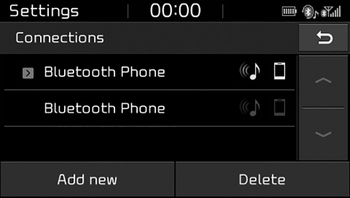 When the [PHONE] button on the audio or the [CALL] button on the steering wheel remote control is pressed, the following screen is displayed. Devices can now be paired. (1) Device name(Vehicle name): Searched name in Bluetooth® device. 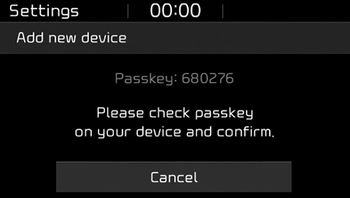 (2) Passkey:Passkey for device pairing. The device name(vehicle name) in the image above is an example. Refer to your device for the actual name of your device. 2. Search for available Bluetooth® devices in the Bluetooth® menu of your Bluetooth® device (cell phone, etc.). 3. 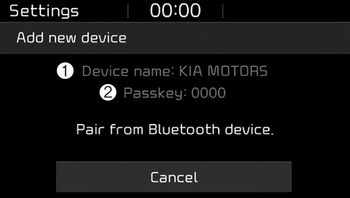 Confirm that the device name (vehicle name) in your Bluetooth® device matches the device name (vehicle name) shown on the audio screen, then select it. 4-1. For devices that require passkey entry, a passkey entry screen is shown on your Bluetooth® device. - Enter the passkey ‘0000’, shown on the audio screen, in your Bluetooth® device. 4-2. For devices that require passkey confirmation, the following screen is shown on the audio system. A 6-digit passkey input screen is shown in the Bluetooth® device. - After confirming that the 6-digit passkey on the audio screen and the Bluetooth® device are identical, press [OK] in your Bluetooth® device. Press the [SETUP] button on the audio system ➟ Select [Phone] ➟ Select [Connections] ➟ Select [Add new(Add New)]. - The pairing procedure from this point is identical to [Pairing the first Bluetooth® device]. Bluetooth® standby mode lasts for three minutes. If a device is not paired within three minutes, pairing is canceled. Start over from the beginning. For most Bluetooth® devices, a connection is established automatically after pairing. Some devices, however, require separate confirmation when connecting after pairing. Be sure to check your Bluetooth® device after pairing to confirm that it has connected.